Apple has considered the possibility of using the iPhone as a form of identification for the user, with one proposed onboard secure storage system using RFID having the potential to use a smartphone as an alternative to a passport for travelers at ports. Filed to the United States Patent and Trademark Office on March 30 and published on Thursday, the patent application for "Document importation into secure element" describes how such a system could import credential data from a source. The same credentials could then be provided to an authority challenging the identity of the device owner as a form of proof. The described electronic device has a short-range radio, namely RFID or NFC, and a secure element for holding data, as well as the ability to process data. Using RFID, the device acquires a "portion of credential information" from an identification document issued by an authority, such as a driving license or a membership card. Once acquired, the device then issues a radio-based request to the issuing authority, triggering the authority to request the required credential portion. Once delivered then approved by the authority, the device then stores the acquired credentials in a secure element. 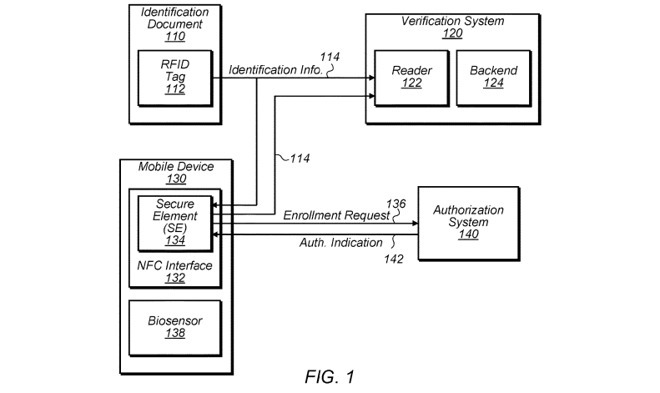 In future identification challenges, the device will be asked for the credentials by the authority, triggering the device to perform an authentication check with the user. While this could be as simple as entering a password, there is also a version that uses biometric security for the device-based authentication. In either case, successful authentication on the device would hand over data to the requesting party. The patent application also cites the growing use of e-Passports, which includes a chip that stores an assortment of data about a user, including their name and date of birth, which can be used by customs officials to determine the user is who they say they are. Apple suggests the described system could potentially hand over a passport number or other similar data, to perform the same check. While in most cases the patent application suggests the use of not-yet-produced hardware, in this case the components are already in place, in the form of the iPhone. It already has radio-based communications with NFC, an encrypted secure enclave that holds fingerprint and facial map data for Touch ID and Face ID respectively, and biometric-based authentication systems. Such a system could be used by private companies, for example in authenticating employees entering a facility, but while the suggestion for the passport number is plausible, legislation becomes the stumbling block. 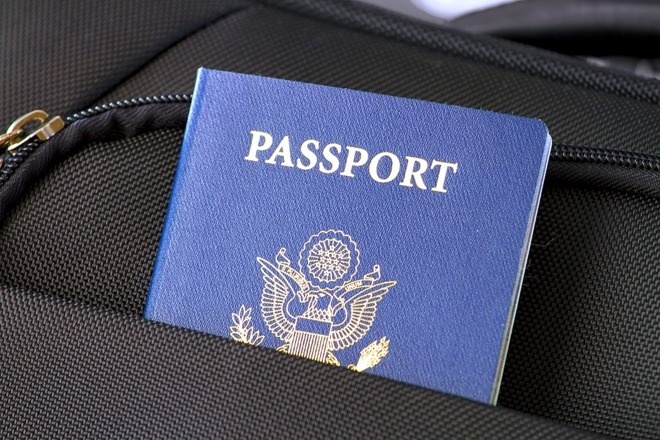 As travelers are required to carry their passport with them while moving across a country's borders, users would still need to carry the document with them, even if this style of system was enabled. For it to work without carrying the passport at all, Apple would need the backing of countries on both sides of a border to allow an iPhone to become a replacement passport. Apple files a large number of patent applications to the USPTO every week, but it is not a guarantee the submitted ideas will make their way into commercial products. Even if most of the components required for it to work are already in place.